It was my birthday a couple of weeks ago, and I got some new toys. Richard bought me an Ashford Rigid Heddle loom (on which more in a later blog post when I’ve made something on it - but in the meantime you can admire the freshly oiled table surface in the photos - as I had to oil the loom before assembling it I figured I’d sand and oil the table too!). And my Mum bought me a sewing machine (or at least I bought it on her behalf). I had my first sewing machine experience back in February when my friend nursed me through my fear and helped me make some lavender bags and a crochet hook case. It made me realise that maybe they weren’t as scary as I’d thought, and I started considering buying one. I had a look around the internet, and came up with a few options. Then popped in to John Lewis after visiting the Wool House and saw the mini sewing machines. First impressions were that they were really light and transportable, meaning that they could be tucked away when not in use. And they weren’t expensive, which mean that even if I didn’t get on with it, and it ended up being tucked away in the loft for years, it wasn’t a ridiculous amount of money wasted. I had a look online when I got home and found a few reviews that didn’t write them off, so I decided to buy one. 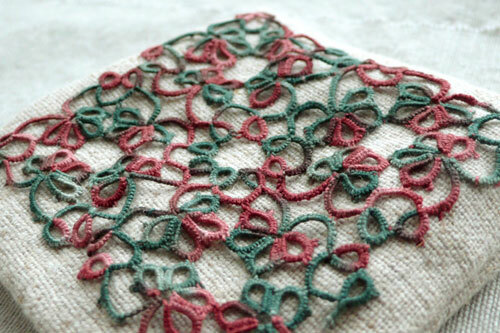 Last weekend I plugged it in, and simply tried it out as a sampler, sewing lines of the different stitches. When I got to position J on the dial, a 2 tier zig zag, it didn’t do quite what I expected, but I didn’t think much more about it. On Wednesday I had a bit of spare time, and so figured I’d start making some lavender bags - these seemed like a good starter project, and I still had some squares left from the charm pack I’d bought as well as some odds and ends left over from other things. But, when I got the machine all set up and ready to go, I couldn’t get the machine to sew a straight line. It seemed to be perpetually doing the scallop pattern of position I on the machine. It’s like it wouldn’t reset it’s position. So I called up John Lewis’s customer services line, who were helpful and immediately ordered a replacement for delivery. The replacement turned up yesterday, and so last night I made a start on the lavender bags. The machine behaved itself well. The manual is really good, and has simple step by step instructions (Richard also bought me this excellent book which I’ve been referring to on and off). I didn’t sew myself to the table, or sew my sleeve up or anything similar. The speed of the machine via the foot pedal isn’t ridiculously speedy - I’m sure it would be too slow for experienced sewers, but it isn’t racing off without me, so I’m pretty comfortable with it. I’m counting this as my first solo sewing machine success. Hopefully the first of many, but if not, at least I’ve managed it once and will be able to look back on this with a bit of satisfaction and hopefully encouragement.